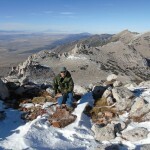 Table Mountain, located in Tooele County’s West Desert, offers a 5,766-foot climb up a peak etched with ancient watermarks from Lake Bonneville. There is something magical, even magnetic, about our West Desert in Tooele and Juab counties. The wild areas that lie out there, day after day, baking under the sun or freezing under the snow, are timeless. If only they could speak about what their blank stares have seen over the millions of years, what a story they could tell. In many parts of the desert, it is silent no matter what time of the day. While there, you truly have the opportunity to relax and enjoy the environment without distractions. One of my favorite spots in the desert is Table Mountain. It is located about 8 miles west from Simpson Springs on the Pony Express Trail and is conspicuous as you approach it from the east heading west. It towers above the landscape like the Great Pyramid of Cheops. While similar in appearance, Table Mountain is much larger and exponentially older than Khufu’s pyramid at Giza. As you get closer to Table Mountain, the road suddenly dives down into a depression, which is named Old Riverbed. According to some geologists, this giant, ghostly channel was carved out thousands of years ago as ancient Lake Bonneville receded and its southern half drained to the north. In the bottom of Old Riverbed, there is a road junction. If you turn left, you will arrive at Delta in about 40-50 miles of desert driving. If you continue straight, you will stay on the Pony Express Trail as it climbs out of the channel, which is over a mile wide here, and back onto the flat plain of the desert. Just beyond the road junction in the bottom of the riverbed is an old monument about 150 meters off the Pony Express Trail, which is accessed by a short, sandy road. The monument marks the site of the Old Riverbed Pony Express Station. After you read the marker on the monument, turn around, look south and you’ll see Table Mountain. 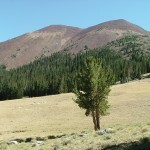 The peak rises to 5,766 feet above sea level, which is not tall when compared to its neighbors, the Simpson and Keg Mountain ranges. But Table Mountain, rising 1,356 feet above Old Riverbed Station, is perhaps more visually impressive, and ancient watermarks etched onto its sides exhibit telltale signs of Lake Bonneville’s presence and depth. All of which makes Table Mountain a tempting target for the adventurer/mountain climber. I didn’t say hiker because reaching the summit of this little mountain is more of a climb than a hike. To reach the best starting point to climb it, continue west across the riverbed and turn left onto what is known as Flint Springs Road. 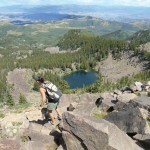 Enjoy the view of Keg Mountain to the south and its numerous hills, canyons and gullies. Follow that road until a side road heads left and southeast directly toward Table Mountain. This road ends at the base of a prominent Lake Bonneville terrace and this is where I park my vehicle and begin to climb Table Mountain. This ancient lake terrace is an interesting place. It is steep and consists of pebbles, rocks and small boulders that are all polished and rounded by water. There is a large and surprisingly flat area that nearly encircles the central cone of the mountain. This is probably the table from which this mountain derives its name. From the valley below, a passing traveler is completely unaware of its existence. From there the view of the remaining climb is intimidating. 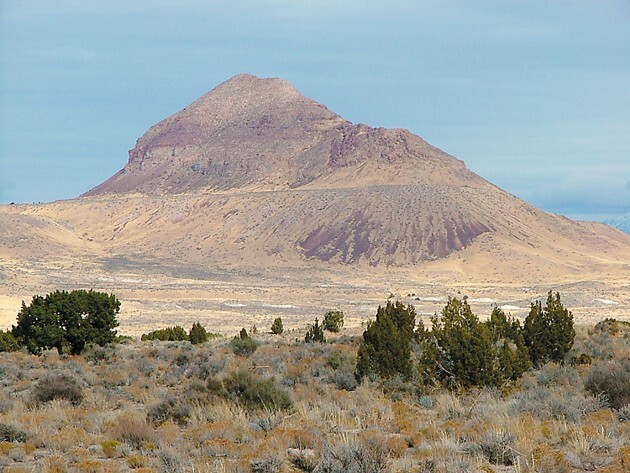 The summit cone rises almost vertically in a series of great cliffs that look to the west upon the bleak expanse of the desert toward Dugway Pass and the Thomas Range. To get to Table Mountain, follow SR-36 south out of Tooele for about 30 miles and then just before Vernon, turn right onto the Pony Express Trail. Proceed west over Lookout Pass and out to Simpson Springs. Take time to stop at Lookout Pass and the old Lookout Pass Pony Express Trail Station site. Stop at Simpson Springs as well and observe the old Pony Express Trail Station House reproduction that is there. Read the interpretive panels. 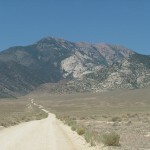 While at Simpson Springs, look west along the Pony Express Trail and you will see Table Mountain, which can be reached by continuing west about 9 more miles. After you leave SR-36 near Vernon, you will be in wild, rugged and desolate country for the rest of your journey. Along this route there is no gasoline, potable water, food, cell phone signal or services of any kind. Be prepared and drive slowly and safely. Contact the Bureau of Land Management for road conditions and enjoy the timeless silence of the desert. In next week’s article, I will describe the ascent of the peak and discuss some more interesting peculiarities of this feature in the Slow Elk Hills of Tooele County’s West Desert. For more information on the Pony Express Trail and road conditions, contact the BLM Salt Lake Field Office at 801-977-4300.